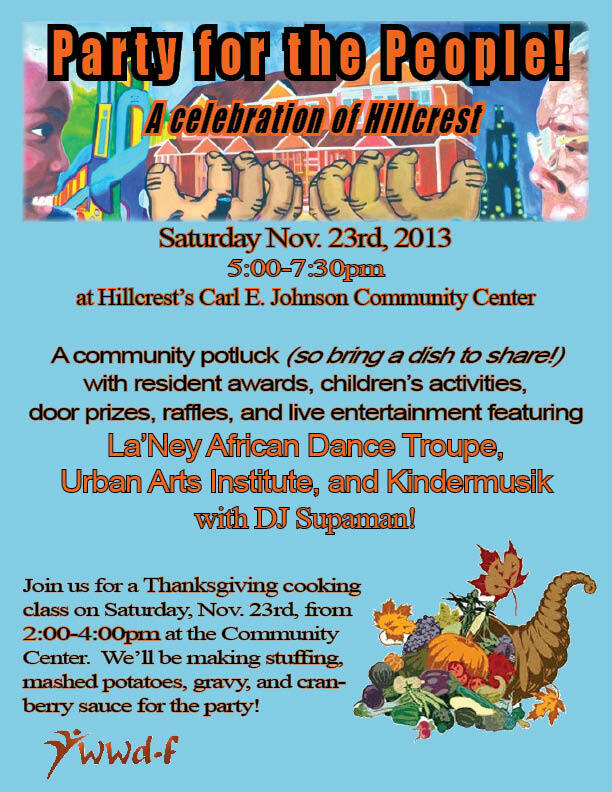 “On Saturday, November 23rd, from 5:00 – 7:30 pm at Hillcrest’s Carl E. Johnson Community Center (100 Atkinson Street), we are hosting the third annual Party for the People, in which Hillcrest residents come together with supporters and collaborators from all over the Asheville community to celebrate the accomplishments of the year, enjoy each others’ company, and build new connections. Party for the People will be a love donation based potluck event, featuring local food, children’s activities, raffle prizes, a resident awards ceremony, and live entertainment including the La ‘Ney African Dance Troupe, the Urban Arts Institute, DJ Supaman and Kindermusik. We would love for you to come out, bring your family, and have a ball with us!